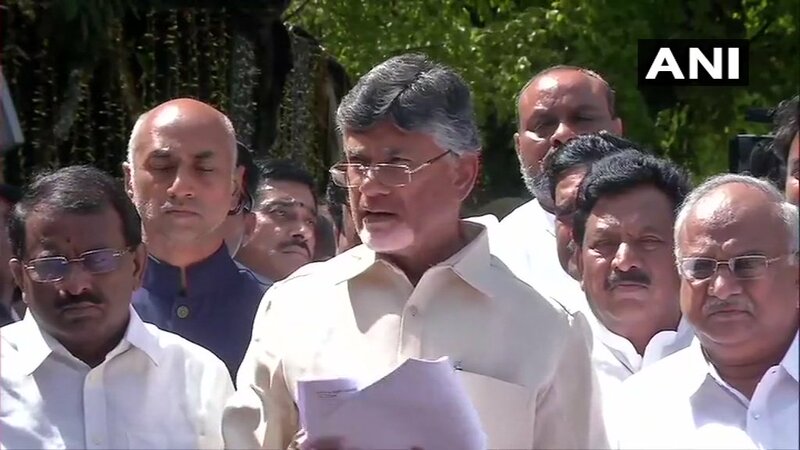 Vijaywada (Andhra Pradesh) [India] March 30 (ANI): Telugu cinema industry on Friday extended support to Andhra Pradesh Chief Minister N Chandrababu Naidu for special category status fight. New Delhi [India], Mar 9 (ANI): President Ram Nath Kovind on Friday accepted the resignations of TDP leaders Ashok Gajapathi Raju and Y.S. Chowdary from the Union Cabinet. Amaravati (Andhra Pradesh) [India], Mar. 8 (ANI): A day after Union Finance Minister Arun Jaitley ruled out "special status" to Andhra Pradesh, state Excise Minister KS Jawahar on Thursday said the Telugu Desam Party (TDP) is ready for a battle with the Centre. New Delhi [India] March 8 (ANI): Prime Minister Narendra Modi on Thursday told the Telugu Desam Party (TDP) ministers who resigned from the Union Cabinet that he is with Andhra Pradesh. New Delhi [India] March 8 (ANI): Two Union Ministers belonging to the Telugu Desam Party (TDP) resigned on Thursday from Prime Minister Narendra Modi cabinet. New Delhi [India], Mar 8 (ANI): Amid the ongoing political tiff between the Centre and Telugu Desam Party (TDP), Prime Minister Narendra Modi on Thursday spoke to Andhra Pradesh Chief Minister Chandrababu Naidu. Chandigarh [India], Feb 28 (ANI): Civil Aviation Minister P. Ashok Gajapathi Raju inaugurated a one-of-its-kind aviation multi skill development centre at Old Civil Air Terminal, here. Chandigarh (Punjab) [India] February 27 (ANI): The Airports Authority of India (AAI) on Tuesday launched the first of its kind Aviation Multi Skill Development Centre at Old Civil Air Terminal in Chandigarh. Vijayawada (Andhra Pradesh) [India], December 13 (ANI): Andhra Pradesh Chief Minister N Chandrababu Naidu on Wednesday took a test flight of sea plane in river Krishna.